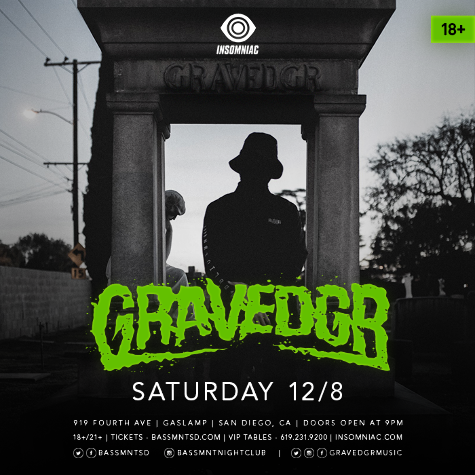 GRAVEDGR will be playing at Bassmnt in San Diego this Saturday, December 8th. The unknown artist first came to my attention when I heard his head bangning tune “Rampage” in June, followed by the equally boisterous “Be Wary” in October. His hard hitting sounds have been found in numerous DJ sets, including The Chainsmokers, Hekler, SAYMYNAME, Valentino Khan, DJ Snake, Nitti Gritti, marshmello, Boombox Cartel, 4B, YehMe2, Flosstradamus, GOMMI, Will Sparks, 12th Planet, Henry Fong, LNY TNZ, RL Grime, Skellism, GTA, Alison Wonderland, Aazar, Zeds Dead, Antiserum, ETC!ETC!, Tony Romera, Ghastly, QUIX, Subshock & Evangelos, Dirty Audio, and more. Doors open at 9pm for the 18+ show with tickets currently at $15.